We’re big fans of a regular cup of joe, but every now and then we’re in the mood for a creamy latte or frothy cappuccino. With the Capresso EC100 Pump Espresso and Cappuccino Machine, we can prepare specialty espresso-based beverages in a snap. And now you can too. Enter to win an EC100, one on Facebook and one on Twitter, now through March 13, 2012. Visit Capresso’s Facebook page to enter and submit and entry form. Follow Capresso on Twitter, @CapressoTweets, and retweet this message to enter on Twitter. Official Facebook Rules: Jura Capresso Inc. is sponsoring this Giveaway of one (1) EC100 Pump Espresso & Cappuccino Machine ($149.99 value). No purchase necessary to enter or win. Binding Agreement. In order to enter the Giveaway, you must agree to these Official Rules. The Rules consist of: (i) the terms and conditions on this page; and (ii) the Entry Form. If you do not agree to the Rules, you are not eligible to participate in the Giveaway or to win any of the prizes. You agree that registration for this Giveaway and/or a submission of an entry in the Giveaway constitutes your agreement to these Rules. Eligibility. The Giveaway is open to legal residents of 50 United States or District of Columbia and aged 18 or older at the time of entry. Employees and their family members of Jura Capresso Inc. are not eligible to win. Giveaway entry period begins February 23, 2012 at 9:30 a.m. CST and ends March 13, 2012 at 11:59 p.m. CST. How To Enter. To enter during the Giveaway entry period you must have a Facebook account. Search for “Capresso,” and then click “Like” to like the page. Click on the “Giveaway” tab below the profile picture and fill out the form. Submit a completed entry form by no later than 11:59 p.m. CST on March 13, 2012. Must use valid email address. One entry per person. Multiple entries will be void. Jura Capresso Inc. accepts no responsibility for submissions delayed or lost, howsoever caused. Winner. Jura Capresso Inc. will select a winner at random and notify the winner via email within one (1) week of the end of the Giveaway. If the winner does not reply within thirty (30) days of notice, we reserve the right to select a new winner. Official Twitter Rules: Jura Capresso Inc. is sponsoring this Giveaway of one (1) EC100 Pump Espresso & Cappuccino Machine ($149.99 value). No purchase necessary to enter or win. Binding Agreement. In order to enter the Giveaway, you must agree to these Official Rules. The Rules consist of: (i) the terms and conditions on this page; and (ii) the Entry Form. If you do not agree to the Rules, you are not eligible to participate in the Giveaway or to win any of the prizes. You agree that registration for this Giveaway and/or a submission of an entry in the Giveaway constitutes your agreement to these Rules. Eligibility. The Giveaway is open to legal residents of 50 United States or District of Columbia and aged 18 or older at the time of entry. Employees and their family members of Jura Capresso Inc. are not eligible to win. Giveaway entry period begins February 23, 2012 at 9:30 a.m. CST and ends March 13, 2012 at 11:59 p.m. CST. How To Enter. To enter, visit http://www.twitter.com/capressotweets and become a follow of @capressotweets . 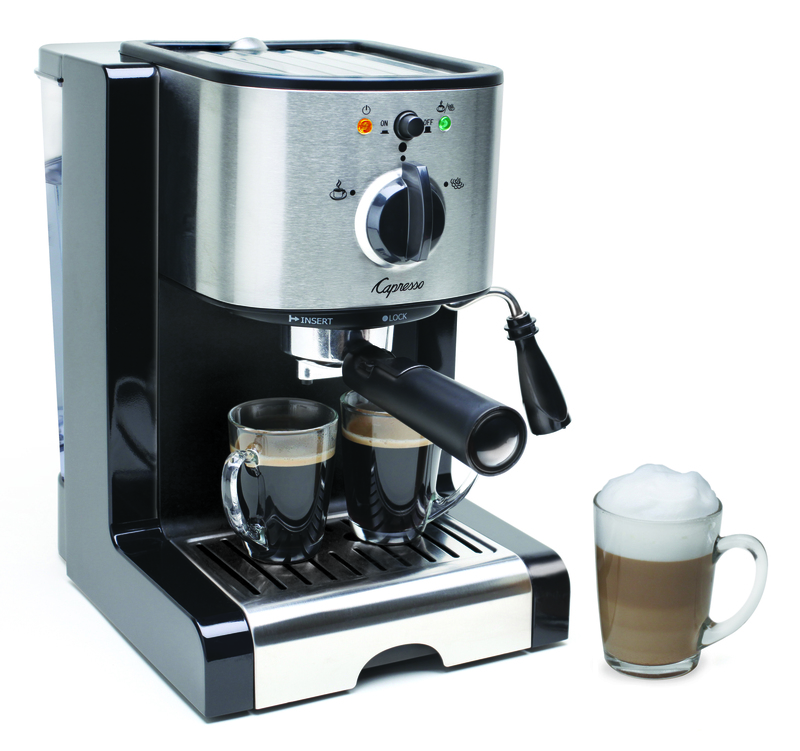 Next, retweet the message, “I just entered to #win a Capresso EC100 espresso machine from @CapressoTweets. Follow & RT to enter #giveaway. http://tinyurl.com/6w2vank.” Entrant must follow @CapressoTweets and retweet by no later than 11:59 p.m. CST on March 13, 2012. One entry per person. Multiple entries will be void. Jura Capresso Inc. accepts no responsibility for submissions delayed or lost, howsoever caused. Winner. Jura Capresso Inc. will select a winner at random and notify the winner via direct message within one (1) week of the end of the Giveaway. If the winner does not reply within thirty (30) days of notice, we reserve the right to select a new winner. Fabulous prize–Thanks for the giveaway! Awesome giveaway! It would be a perfect gift for my boy friend coz he Espresso so much!